The Sun joined with Mercury in determined Scorpio provokes probing questions that shouldn’t be asked unless you are ready to hear the truth. And while Venus joined with Saturn in moralistic Sagittarius puts a lot of rules and restrictions on romance, this energy seals the deal for couples who are ready to commit. Here is your Weekend Horoscope. Your personal astrology reading is waiting! Click here to learn more about Psychic Krishni. You are on the verge of elevating pillow talk to an art form, but before you get too racy you had better learn the rules of engagement. You are entering sensitive territory. Find out what your lover is comfortable with before you say something that ruins the mood. Your ruler Venus, joined with restrictive Saturn makes you feel as though your partner can’t or won’t fulfill your needs or that you will never connect with the right person. The universe is inviting you to give a lot of thought to what you want and to hold out until you get it. The Sun joined with your ruler, Mercury, prompts you to ask the right questions so that you can find out what you need to know about a particular job or task. Matters pertaining to health or fitness will also benefit from your quest to be better informed. Your Weekend Horoscope shows that you are devoting your time to a project that you feel passionate about. It doesn’t feel like work when you love what you are doing and you feel invested in the outcome. This could be a long-term project, so prioritize tasks and pace yourself. Romance isn’t always fun and games. Sometimes you have to make a real effort to prove your worthiness and to build up the kind of trust that can take things to the next level. This weekend’s make-it-or-break-it energy could determine where your love life heads from here. The Sun joined with your ruler, Mercury, gives your communication skills a big boost. This is a great time for projects that involve writing, public speaking, teaching, or learning. Your networking skills are pretty savvy too, so get out and meet the people you need to know. Your ruler Venus, joined with determined Saturn could inspire you to make a pretty serious declaration about a romantic matter. What you say will leave a lasting impression, so be sure to choose your words with care. Expressing what matters most to you is a good place to start. The Sun and expressive Mercury, joined in your sign, makes you awfully talkative. You are not usually one to let the cat out of the bag, but this weekend you will be pretty comfortable sharing your thoughts with others. Feeling restless? Do something that will keep your mind engaged. You have never been more serious about love. If you are coupled, you could be ready for a bigger commitment. If you are single, you might feel lonelier than ever. The good news is that you possess the maturity to know what you want and the perseverance to wait for the right person. Your Weekend Horoscope reveals that unrequited love or a secret romance might be stressing you out. You can keep it on the down low for a little while, but eventually your secret will come out. Will you continue to carry the flame? Or is it time to extinguish it forever? This is a great time to get out and meet new people. Whether you network within your professional circle or spend time hanging out with friends, the vibe is right to forge meaningful bonds. Who do you want to meet? And how can you make the connection? 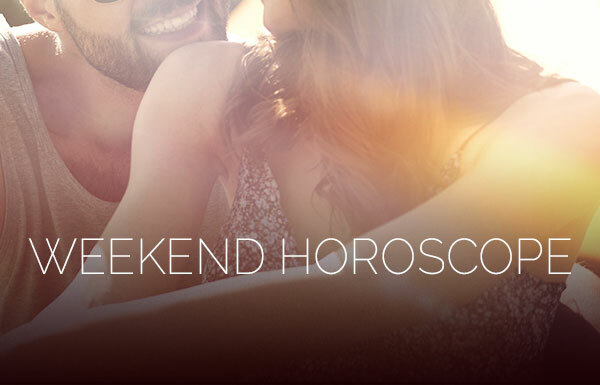 Your Weekend Horoscope reveals an opportunity to polish your skills or to learn something new. Whether you take a class, read a book, or travel to an interesting destination, knowledge that you acquire now could help you with a current career goal. Be on the lookout for ways to grow. Lyne, I look forward to hearing from you! thank you! I feel a deep spiritual connection with you in matters of love, and relationships…I look forward to communicate with your network more as the days increase.